1. Boil a large kettle. Rinse the brown rice. Finely dice the onion and crush or finely chop the garlic. 2. Heat a saucepan with 1/2 tbsp oil, cook the onion and garlic for 4 mins until softening, then stir in the brown rice and smoked paprika for 1 minute. Pour in 400ml boiling water and crumble in the half vegetable stock cube. Leave to simmer for 20 mins. 3. Meanwhile, dice the tomatoes and roughly chop the parsley. Cut the lemon into 4 wedges. 4. Heat a frying pan on a high heat with 1/2 tbsp oil, cook the whole padron peppers for 4-5 mins, until turning golden brown. Remove from the pan, set aside and keep warm. 5. After the rice has been cooking for 20 mins, add the diced tomatoes, half of the chopped parsley and the juice from 2 lemon wedges to the rice and cook for a further 5-10 mins or until all the water has been absorbed and the rice is tender. Add a little more boiling water if needed. 6. Meanwhile, season the haddock with a pinch of sea salt and black pepper. In the same frying pan as the peppers were in, heat 1 tbsp oil and cook the haddock fillets skin side down for 2-3 mins each side, until cooked through. 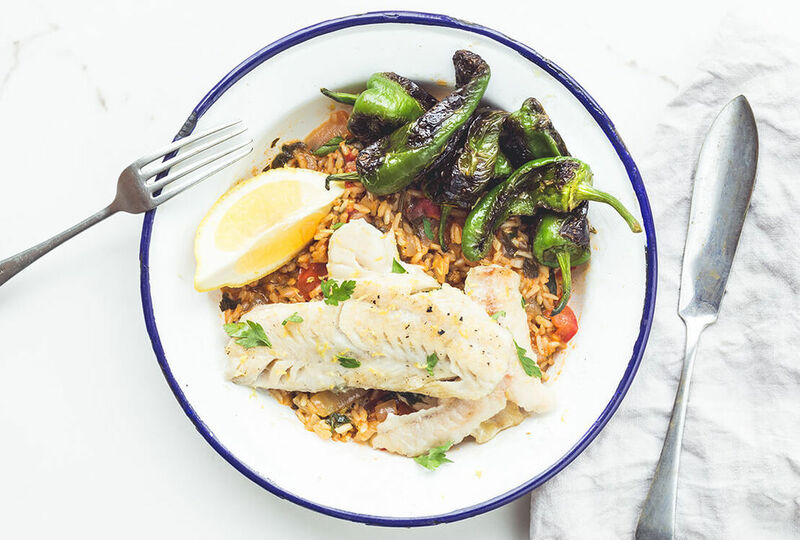 7.Spoon the Spanish-style rice onto two warm plates, top with the haddock and padron peppers. Sprinkle over the remaining parsley and serve with the remaining lemon.